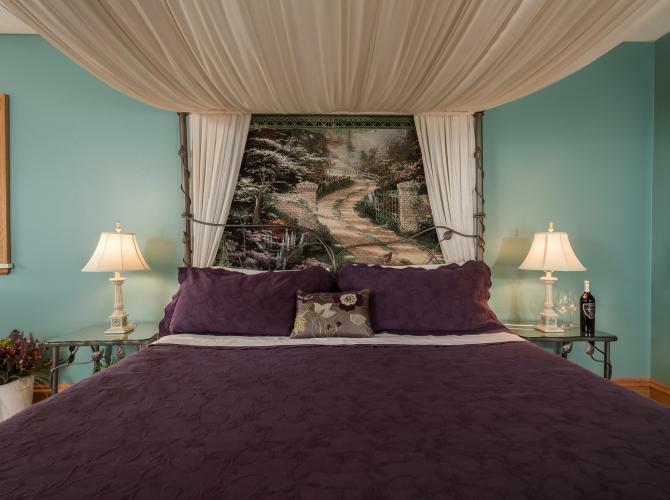 From the moment you enter the Inn at Wawanissee Point, you realize you're in no ordinary bed and breakfast. 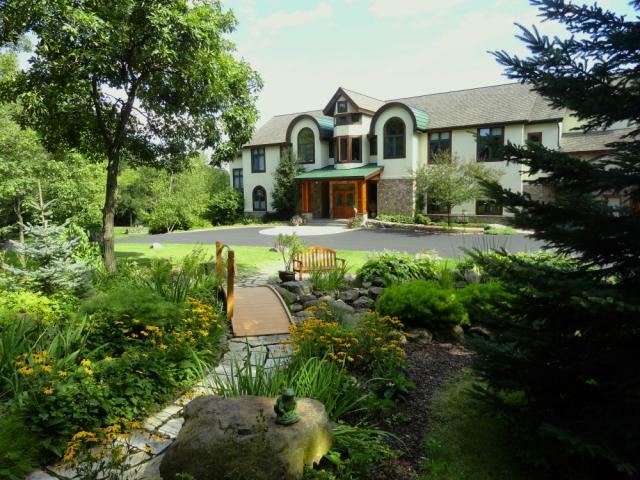 The Inn offers one of the most scenic, peaceful and romantic getaways in south-central Wisconsin. 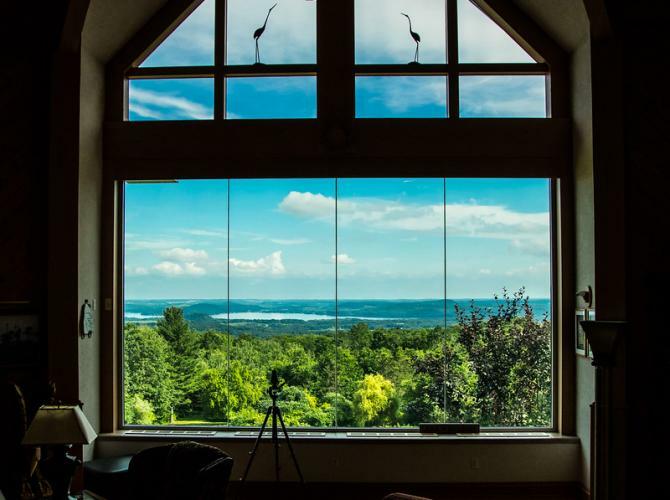 This luxurious villa with a captivating view is nestled atop a pristine, 42-acre, wooded estate in the nationally renowned Baraboo Hills, a geological treasure. 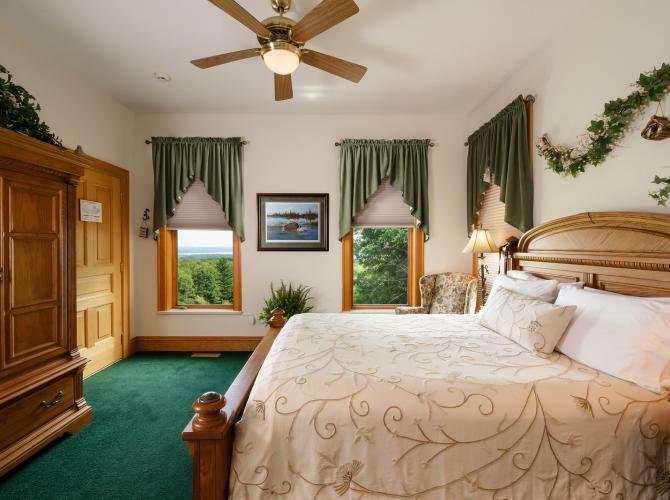 The Inn's amazing, southern vista provides a panoramic view of the Lake Wisconsin valley and the state's Capitol dome in Madison, 36 miles away! The Great Room and its massive window greet you upon arrival. The view immediately leaves you awe-inspired. Richly detailed oak and warm cedar surround the contemporary sitting area with a large, fieldstone fireplace and baby grand piano. The Inn is adjacent to Devil's Lake State Park, Riverland Conservancy's Merrimac Preserve and the Ice Age National Scenic Trail, Devil's Head Ski and Golf Resort, and is a short drive to the American Players Theatre, Wollersheim Winery, International Crane Foundation, Aldo Leopold Legacy Center, Ho-Chunk Casino, Circus World Museum, Mid-Continent Railway Museum, 400 State Trail in Reedsburg, Mirror Lake State Park and Wisconsin Dells. Madison attractions are 50 minutes from the Inn. Country gardens, flowing springs and abundant wildlife surround the Inn, which is open year-round. We offer the perfect spot to stargaze on the secluded, prairie terrace beside a campfire or simply enjoy a moonlit night. Choose among four, luxuriously decorated guest rooms for your retreat for a night, a weekend or as long you wish. 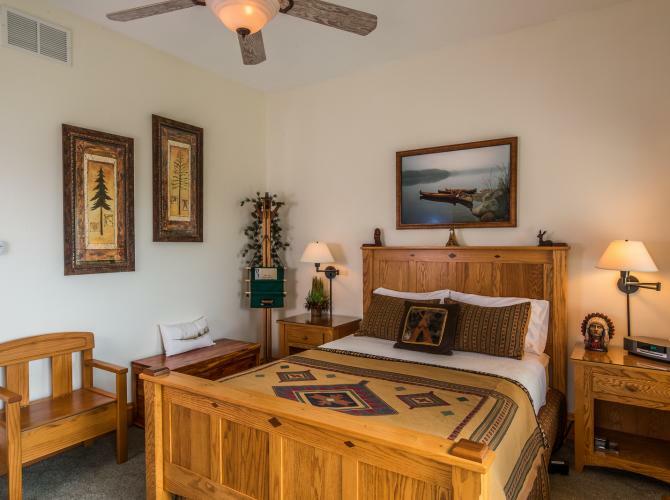 For your comfort and relaxation, all guest rooms include: private bath, HDTV, DVD, Bose Bluetooth radio/CD player, air-conditioning, ceiling fan, mirror, hair dryer, plush robes, reading lamp, extra pillows and blanket, and of course high speed internet streaming. We provide turn-down service each evening. 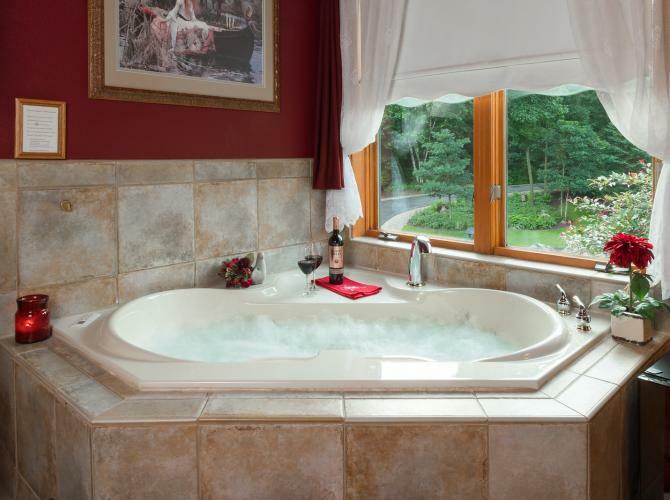 Enjoy the sauna, hot tub or schedule an in-room massage. Relax in-season in the hammock or patio lounge chairs with a favorite book. 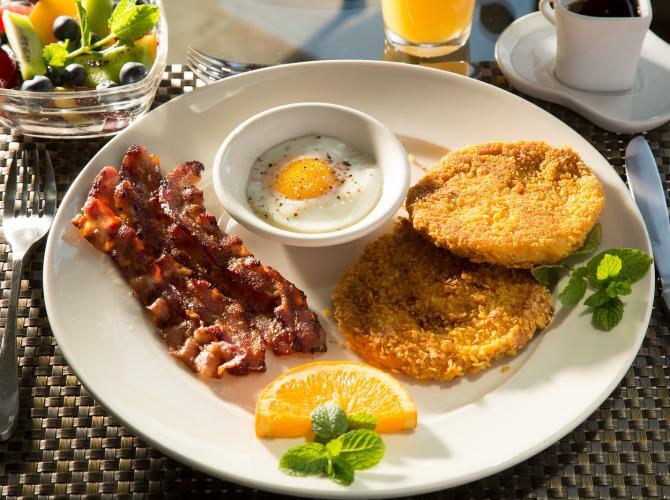 We freshly prepare a delightful, sumputous breakfast each morning, served in the sunroom, dining room or adjacent deck. We'll modify breakfasts to dietary specifications. Lunch and dinner are not served, but there are many fine restaurants within a short drive in Baraboo, Wisconsin Dells or the Lake Wisconsin area. 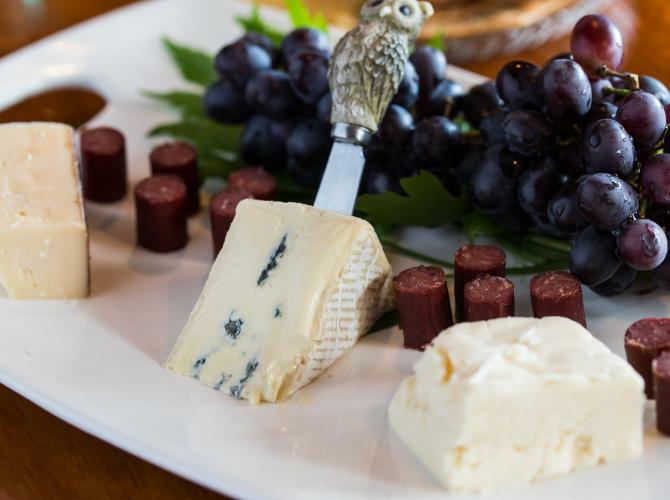 Enjoy wine and cheese hour in the Indigo Lounge each evening. Outdoor enthusiasts, birders, hikers, photographers, cyclists and cross-country skiers enjoy nearby recreational facilities. 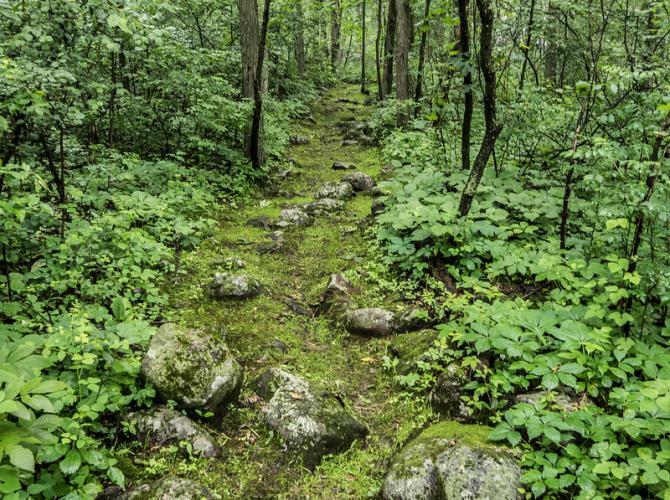 Hiking on the estate's private trails, at Devil's Lake State Park, Mirror Lake State Park or at nine nearby state natural areas and preserves, or exploring the Ice Age Trail awakens the senses with the unique sights, smells and sounds of the back country. Wawanissee Point offers acres of wildflower meadows and woodland trails for birding. Two state conservation organizations recently designated the Baraboo Hills as an important bird area, where 135 bird species breed. Enjoy bird feeders throughout our grounds. A guest favorite is viewing hummingbirds up close while eating breakfast. The 16,000-acre Leopold-Pine Island Important Bird Area along the Wisconsin River is 20 minutes northeast of us. Best of all, we're close to a migration place where American bald eagles winter and some now nest. Bird books and field guides are available for guest use. 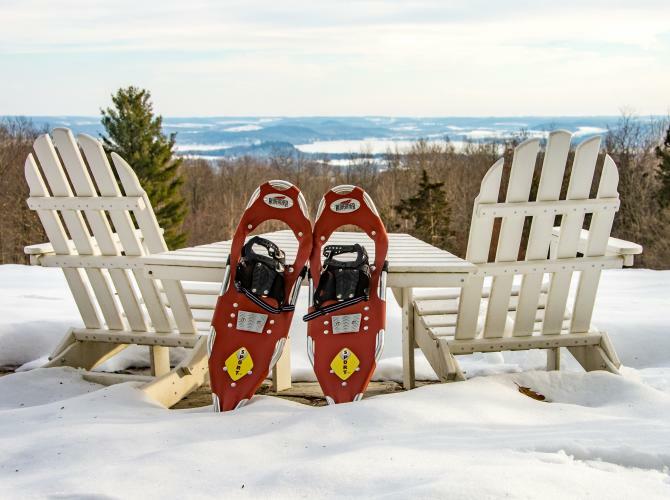 Snow lovers can use our snowshoeing equipment on our private trails. Liveries on the Wisconsin River rent canoes and kayaks. Lakes, rivers and streams surrounding the Inn provide excellent fishing. Nearby golf courses challenge visiting pros and some welcome beginners.Businesses needing a site for small retreats will find the Inn's relaxed atmosphere perfect. The peaceful setting eliminates the stress of everyday life. The luxurious rooms, common areas and conference room for 12 are ideal for bringing top people together, high in the Baraboo Range, where you can see far and clear. There is free, wireless, high-speed Internet access throughout the Inn.